We've been interested in HTPCs for certainly the last few years and have been covering integrated graphics motherboards with the emphasis of using them in these scenarios for the last year, testing important factors like power consumption, HD capability and video quality. We aim to run this buyer's guide quarterly to cover everything from the smallest mini-ITX builds, to the most awesome full HD capable gaming behemoths. While we will still aim for the best value for money, all the builds must be able to handle 1080p full-HD playback with possible Blu-ray support and there is a deliberate balance between efficiency, noise and performance - basically being "just capable" to do what is required, while having the best feature-set to do it with. We respect everyone's needs are different and we are deliberately leaving space where possible to include a TV card (which are sometimes region or software specific) or more/less internal storage should it be a media hub, or simply a front end where media is stored elsewhere, like a NAS box. If you've got any questions, comments, or better hardware choices - let us know! The tiniest PCs have always been popular, but more recently have they become both affordable and capable for a home theatre use. Mini-ITX is the smallest of the popular form factors - it's better in that it's often lower power, but it doesn't have to be limited in terms of features. If you've a particularly tiny void to fill this could be your best option. Based on the excellent AMD 780G chipset, our current little favourite is still the J&W Minix motherboard. This little wonder was the base for Nick's Mod of the Year winning Chiaroscuro and has tonnes of functionality compressed into its 17x17cm PCB. 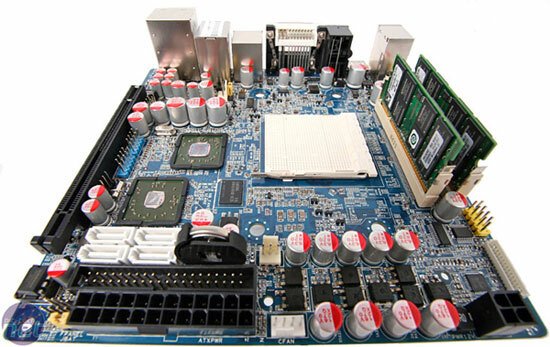 The feature set includes four SATA, HDMI, DVI, VGA, eSATA, S/PDIF and a PCI-Express x16 (x4 electrical) - everything you'd expect from a high end board, and more. The AMD 780G chipset includes UVD video acceleration too, and if you do feel the extra need of UVD2 from a Radeon 4000-series graphics card, as one of the only mini-ITX boards with a PCI-Express x16 slot, it has the capacity. It may only accept up to 65W CPUs, but that still covers plenty of dual-cores and even a couple of quad-core processors as well. The Athlon X2 4850e has become AMD's "Q6600" in our books - month after month we keep recommending it because of its exceptionally low power, just a 45W TDP, and its competitive price. It's extremely inexpensive at under £50 and at 2.5GHz, it's completely capable for most, if not all HD playback (I can vouch from personal experience). Having said that, clock for clock, Intel’s Core microarchitecture is significantly faster than the old K8 architecture, but that's not to say AMD's processors are inadequate for today's computing tasks - quite the opposite in fact. Compared to the Intel solution we suggest in the alternative choice, the AMD is slightly cheaper too. While we’ve seen that 4GB of memory offers very real advantages over 2GB, and for a nose over £30 this Crucial 4GB kit of DDR2 SO-DIMMs may be only PC2-6400 at CL6, but performance memory isn't needed here (especially not with the 5,400 RPM hard drive over the page). What do you get when you combine a fully featured digital TV recorder, NAS and digital video player with enough outputs to make AV enthusiasts swoon? The AC Ryan Playon! DVR TV that's what! We take a look to see if this jack of all trades device deserves a place beside your TV.